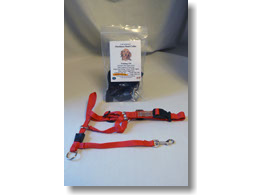 These products are for use in the training of dogs in long distance methods for working dogs and for the casual owner. 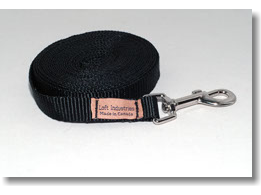 All these items are made from 3/4" wide webbing. Available in BLACK only. This is a revolutionary new method for training your dog. However, this is not a "magic bullet" nor is it a "quick-fix" for behavior problems. Any effective training requires two main things: time and consistency. Another helpful component to effective training is gaining the trust of the animal that you are working with; Loft's S.N.A.P. Harness is one tool that will help you gain that trust. Loft's S.N.A.P. 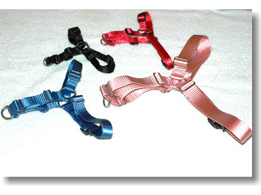 Harness does not tighten nor constrict the chest in any way. When properly adjusted, Loft's S.N.A.P. 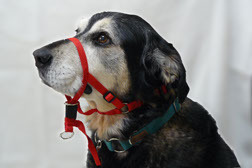 Harness will not choke the dor nor interfere with their mobility. It is not a hobble or a choke harness. Loft's S.N.A.P. 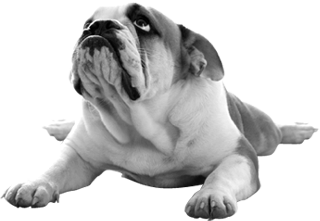 Harnes also allows you the owner to take advantage of the instinctual patterns that all dogs are bred with by having you become the Alpha dog or pack leader. 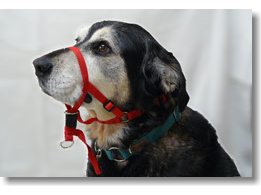 This will require tht you become confident and consistent in your interactions with your dog during the training process. As alpha dog you will need to always be in front with the dog walking beside or behind you. The front connection point on the Loft's S.N.A.P. Harness allows you to do this. Small Fits: Jack Russell Terrier, Poodle, Beagle, etc. Medium Fits: Cocker Spaniel, Border Collie, Boxer, etc. Large Fits: Retriever, German Shepherd, Rottweiler, etc.